A very active and enthusiastic crowd of buyers met April 19 at the Yellowstone Boys & Girls Ranch, west of Billings, Montana, for the annual REAL Ranch Horse Invitational Sale. 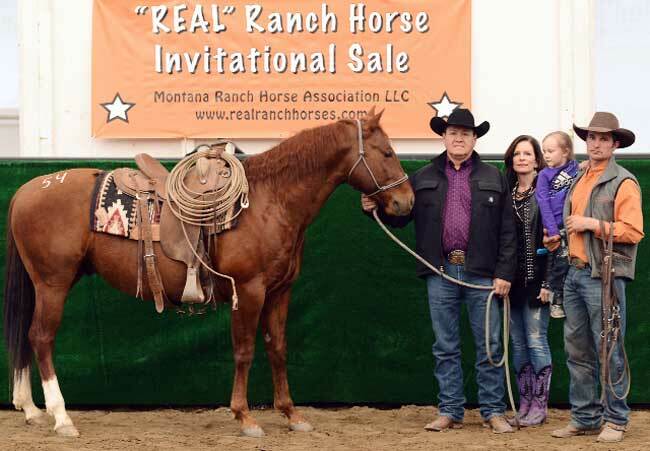 Interest in guaranteed-to-be-authentic ranch-ridden horses just keeps increasing – as evidence, this eight annual REAL Sale continued to enjoy an ever-increasing average. The top five horses sold averaged $16,500; top ten $13,600; top twenty $11,000; and all ranch horses sold averaged $8,650. Additionally, a few young (and less experienced) ranch horses sold. The top five young horses averaged $6,750; all the young ranch horses sold averaged $4,650. New to the sale this year was the exhibit and sale of a stock dog, consigned by Chris Hatch of Lovell, WY. Diamond B Ranch of Maui, HI placed the winning bid at $1,450. 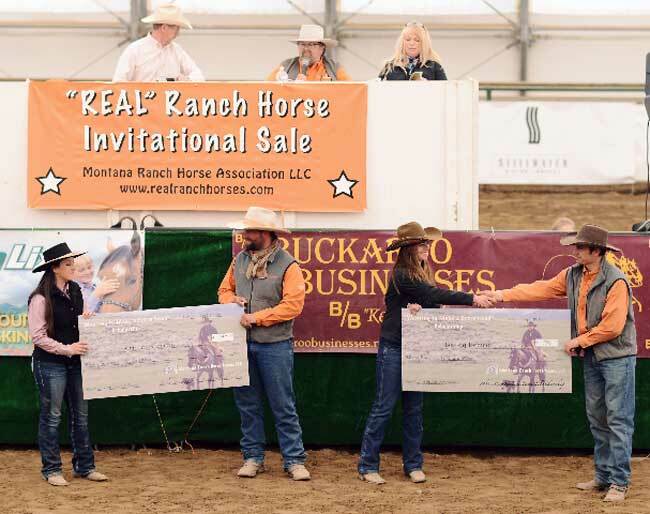 Montana Ranch Horse Association members Josh Bilbrey, far right, and Jake Hahn, third from right, present scholarships to Kristen Cerroni (at left) and Bailey Remmich. Ethan Hall holds the high-selling horse consigned by Josh Bilbrey (at right) and purchased for $27,000. High-selling horse: Lot 54 “Rawhide Tari Bonkers,” a 5-year-old AQHA sorrel gelding consigned by Josh Bilbrey of Bozeman, MT and purchased by Ethan Hall of Mandaree, ND for $27,000. Second high-selling horse: Lot 10 “Rawhide Rooster Te,” a 7-year-old AQHA buckskin gelding consigned by Blaine Humble of Faith, SD and purchased by Ethan Hall for $16,000. Third high-selling horse: Lot 11 “Ace,” an 11-year-old grade red roan gelding consigned by Quinn Larsen of Shell, WY and purchased by Dawn Calderwood of Billings for $15,000. Fourth high-selling horse: Lot 56 “Rawhide Stylish Dude,” a 7-year-old AQHA gray gelding consigned by Nate & TJ Wald of Lodge Grass, MT and purchased by Diamond B Ranch of Maui, HI for $13,000. Fifth high-selling horse (tie): Lot 16 “Rawhide Zip Tip,” a 4-year-old AQHA sorrel gelding also sold by Josh Bilbrey and purchased by Diamond B ranch for $11,500. Fifth high-selling horse (tie): Lot 76 “Captain Jack,” an 8-year-old grade buckskin gelding consigned by Jared Gill of Lysite, WY and purchased by Ethan Hall for $11,500. The top selling young ranch horse: Lot 43 “FQHR Swivel Watch,” a 5-year-old AQHA bay roan gelding consigned by Charles Hall of Red Lodge, MT and purchased by Randy Stoner of Kilgore, NE for $7,500. Second high-selling young ranch horse: Lot 58 “Gumbo Sugar Nic,” a 5-year-old AQHA bay roan gelding consigned by Matt Noyes of Big Horn, MT and also purchased by Randy Stoner, for $7,000. The final sale tally showed that horses sold to California; Colorado; Hawaii; Montana; North Dakota; Nebraska; Wyoming; and Alberta, CA. Volume buyers included Diamond B Ranch of Maui, HI; Park Range Ranch of Walden, CO; Ethan Hall of Mandaree, ND; Michael Hooks of Red Lodge, MT; Taylor Brown (LO Bar Ranch) of Sand Springs, MT; and Randy Stoner of Kilgore, NE. Each year at the REAL Ranch Horse Invitational Sale a benefit colt is sold with 100% of the purchase price going to Yellowstone Boys & Girls Ranch. This year the benefit colt, a 2-year-old AQHA red roan gelding, came from Froelich Quarter Horses of Selfridge, ND. The colt was purchased by Robert Model (Mooncrest Ranch) of Cody, WY for $2,400. Dates for next year’s sale are April 17-18, 2015, and next year’s catalog is already filled with horses that are making lots of tracks this branding season.